Visitors from far places go to Jovellar, Albay, to experience the hidden underground river. Why should Annaliza Broqueza leave her hometown? LEGAZPI CITY, Philippines – It seems ironic that tour guide Annaliza Broqueza did not always have a firm sense of direction in life. The catalyst that put the native of Jovellar, Albay, off-course was the untimely death of her husband in January 30, 2012. She remembered that there was almost no time to grieve. The soft-spoken and sweet-natured mother of 3 instantly knew she needed to immediately work to support her teenage son and daughters through high school. Not knowing where to start, she tried selling native products in Albay. After all, it was one of the most popular sources of livelihood by mothers like her in their neighborhood. She sold pili nuts, tablea, banana chips, and other native food items to tourists. That did not work out well for the former plain housewife. There were just too many of them selling the same products to the same limited market. After 5 months of selling native products, Broqueza decided to try her luck in Manila, leaving her children with their grandparents in Albay. From then on, she hopped of from one home to another to take care of other people's children. She worked as a maid in Valenzuela, and then, after a few months, in Dasmarinas, Cavite. After a while, she transferred to Batangas. She was not the only one who took on the same path. A study of the Center for Women’s Resources (CWR) released in March 2017 showed that at least 1.8 million of women workers are engaged with "other services activities." At least 89% of these women are employed in private households. The women receive low wages, or as low as P2,500 ($50) a month. This is much lower than the mandated minimum wage in the country. Fortunately, Annaliza was luckier than the majority. Her salary in 2012 started at P2,500. But this eventually increased to P9,000 in just a span of 4 years. "Noong nasa Manila ako, tuluy-tuloy ang trabaho ko. Bale po 4 na taon ako namasukan bilang kasambahay. Napakasuwerte naman ako sa mga employer ko mababait po sila," she said. Through pure determination and hard work, Broqueza was able to send her son and daughters to high school for 4 years. The decent pay did not automatically equate to an easy life in Manila, however. Beyond the fatigue brought about by the physical demands of her job, Broqueza battled with the feeling of loneliness caused by her separation from her children. "Wala po akong hiniliing talaga na makauwi sa lugar ko na kasama ko mga anak ko na may pinagkakakitaan (I have no other dream but to go home, find a job, and be with my children while still having a means of livelihood)," she mused. For 4 years, she comforted herself with the idea that by working elsewhere, her children continued with their education as planned. She believed that working in Manila was her best bet at providing a promising future for her children. "Iniisip ko na lang po araw-araw ako ay may sahod pagdating ng kinsesnas or katapusan. Ako po ay makakapagpadala sa kanila (I comforted myself with the idea that I will receive my salary every payday. Then, I would be able to send money to my children)," she said. The dream of going back home for good never left her until one day, in December 2016, after 4 years of working in Manila, she booked a one-way bus trip to Albay, and never looked back. It was the thriving eco-tourism in Jovellar, Albay, that convinced her to stay for good. She discovered that the hometown she used to know now boasts of various tourist areas that drew visitors here and abroad. "Pinili ko nang magstay. Kahit 'yung ibang naging amo ko, minsan tinetext ako ng iba ako'y bumalik. Malalaki din po ang sahod (I decided to stay even if my employers texted me and asked me to come back. They promised a big salary)," she said. It was not always that way. What changed? The area used to be the stronghold of communist rebels. When their numbers dwindled in early 2015, the local government saw it as an opportunity to strengthen local tourism in the area to help the community grow. For many in the neighborhood, Jovellar became more than their home – it was also their main source of livelihood. According to Rome Candaza, a tourism consultant for the Jovellar underground river project, they focused on establishing a sustainable form of livelihood while empowering the community at the same time. "Sabi nga namin, paano mo mabibigyan ang tao ng sustainable na trabaho? Eh bigyan mo siya ng trabaho na nandoon siya sa lugar niya at hindi niya kailangan mageffort pa o umalis para kumita noon. Mabibigyan mo siya ng responsibilidad sa pagprotekta ng kanyang lugar is because bibigyan mo siya ng trabaho. Dahil 'yung trabaho na 'yun na nandoon sa community, kumikita siya doon, pangangalagaan niya 'yon," Candaza explained. Before, people would earn only a measly amount of P50 per day. After they introduced the ecotourism project in Jovellar, daily income of residents grew to P200 per hour. "It's a big impact po sa community dahil alam po niyo na dati, they're just relying for the help of the national government or anyone from the government na masuportahan sila. Ngayon po they can stand alone on their own. They're earning a lot in their own place and not leaving the community. And they can protect the environment na mayroon sila ngayon," Candaza added. The same is true for Broqueza who eventually applied to become a volunteer tour guide. In a day, she could easily earn up to P2,000 through tips from hundreds of tourists who visit their quiet hometown. Jovellar's main attraction is the hidden underground river in Barangay Quitinday. The 180-meter-long river is unique, Broqueza would boast. 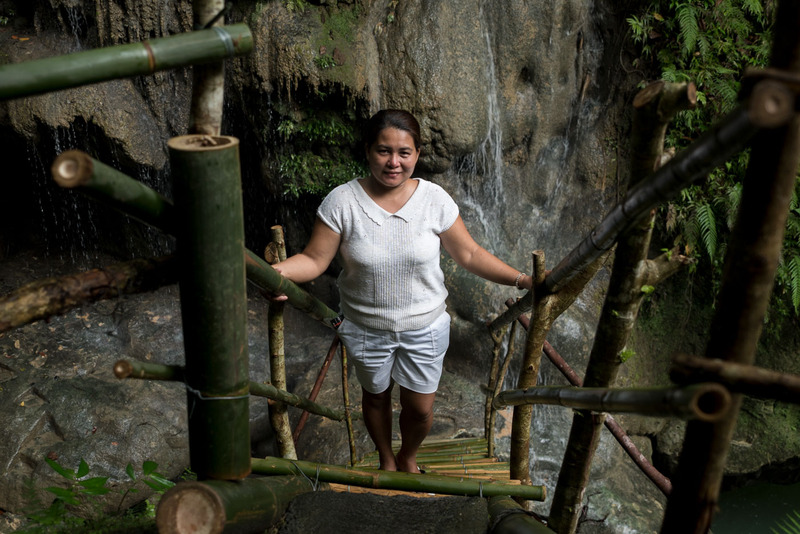 Unlike the popular underground river in Palawan, she said the one from her hometown allows tourists to enjoy a bath with the steady flow of fresh water coming down from the waterfall. "Ngayon po 'yon na talaga ang trend sa tourism na dapat experiential. Experience po ang binibenta namin dito sa Jovellar. Ito kasing underground river na ito even though maikli lang po siya, immersive po ito. For example po 'yong ibang underground river, doon po talagang para kang nagtu-tour lang. Dito, mababasa ka, maliligo ka sa dulo ng underground river sa falls. Talagang mae-experience mo 'yong nature," Candaza explained. The water is approximately 25 to 30 feet deep. Many tourists – from across the archipelago and around the world – would visit the sleepy town of Jovellar just to get a glimpse of nature's beauty. They would enjoy jumping off from a cliff on the river, take a bath beneath the falls, and go through the dry caves around Jovellar.